"[W]e should never lose sight of the fact that even a person accused of the most heinous crimes, and no matter the likelihood that he or she actually committed those crimes, is entitled to the full protection of the [law]. Short-cutting or short-circuiting those rights affects not only the accused, but also the entire reputation of the criminal justice system." — Decision of the Canadian Supreme Court in R. v. Burlingham,  2 S.C.R. 206. Watch the lawyers do their thing. Also commonly known as a Courtroom Drama, this is a work of dramatic fiction principally about litigation: be it civil or criminal cases, with the latter being more common because it often makes for better drama note Even though the vast majority of the work of the courts and the legal profession more generally is civil, civil law largely consists of people arguing about money, and often it ends up being a contest of who can afford to pay their lawyers the longest. Actual courtroom time also tends to be pretty boring in a civil case, either talking about points of law that don't make sense to anyone who hasn't been to law school or mind-numbingly obscure testimony from experts about stuff like projected income and (if you're lucky) reconstructions of how a bodily injury occurred. The main exception to this is family law, in which people often fight tooth and nail well past the point at which they have run out of funds, because in such cases emotion is the primary driver of litigation; however, family cases are harder to dramatize, since nobody wants to watch lawyers arguing for hours about how the money the husband spent on his mistress justifies an increase in the wife's alimony or how the fact that daddy loves little Timmy and makes it a terrible deprivation for little Timmy to be away from his father for more than three days at a time. There are some exceptions to these (personal injury, medical malpractice, and certain other tort cases can occasionally make for good reading/viewing, and if you can stomach them, domestic violence cases often produce some strong drama—when they're not just angry ex-boyfriends/ex-girlfriends flooding their former lovers with text messages), but by and large civil and family cases don't really make especially good television. Criminal law on the other hand is about crime and punishment, which anyone can easily understand and is actually fairly riveting to watch.. A military courtroom drama is one of the most common subgenres. Most crime dramas focus on criminal investigations done by law enforcement officers (in the form of a either a Cop Show or a Police Procedural) and does not often extend to anything happening in a courtroom. 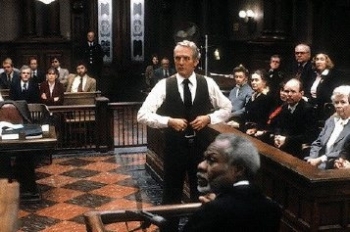 In such works where courtroom drama only lasts a single or in a few episodes only, it's a Courtroom Episode. If you're looking for works about people who make the law, see Government Procedural. Courtroom Antics are to be expected. Also see The Courtroom Index for a list of common tropes. Wizard Barristers: Law Procedural meets Urban Fantasy. Chrysalis Visits The Hague is about Queen Chrysalis facing an ICC war crimes tribunal, and the legal and social implications thereof. Vinyl and Octavia Duel Destiny is this, as it's mostly a homage to Ace Attorney. Turnabout Storm, another major Ace Attorney/My Little Pony: Friendship Is Magic Crossover. 12 Angry Men The jury deliberation is the only focus on the film/play. Chicago, in part, as it cover's Roxy Hart's trial for the murder of her lover in a crime of passion. Compulsion, A 1959 film with Orson Welles, based on the Leopold and Loeb murder trial. Denial, A 2016 film about a libel suit between American Holocaust specialist Deborah Lipstadt (and her publisher) and British Holocaust denier David Irving . M, featuring not a legal courtroom but the criminal underworld equivalent. The Trial a 1962 film by Orson Welles, based on the novel by Franz Kafka. Witness for the Prosecution. Billy Wilder's adaptation of Agatha Christie. The Associate and Rogue Lawyer are legal thrillers by John Grisham. Njal's Saga, a saga of a lawyer in medieval Iceland. Possibly the Ur-Example. Snow Falling on Cedars is a legal thriller by Scott Turow. Spisi i ljudi (Documents and people) by Serbian lawyer and academic Tibor Varadi is a somewhat fictionalized account of the legal cases from his family archive, spanning from 1893 until today. Storming the Court: How a Band of Yale Law Students Sued the President—And Won by Brandt Goldstein. Verbrechen (Crime) by German lawyer Friedrich von Schirach. Although he stated that the cases presented were fictionalized accounts of his actual cases, those were later debunked. The Night Of covers Police Procedural as well as jail and law procedural. Perry Mason. 80 novels. Ur-example and Trope Codifier in Television. Sad Cypress . An Agatha Christie novel adapted for Radio and Television. Shots Fired, some partial involvement of a prosecutor investing potential shooting motivated by race. Suits, which is fairly unique in that a) it's about corporate lawyers and civil suits and b) the characters have a stated desire to avoid the courtroom at all costs. The Wire Occasionally, with emphasis on the police-attorneys collaboration. The Broken Jug (Der zerbrochne Krug) by Heinrich von Kleist. The central element is a trial in a rural court. A Man for All Seasons, and its film adaptation. Parade, a Broadway musical set around the murder trial of an innocent man. Supernatural Law, which combines this genre with Urban Fantasy.